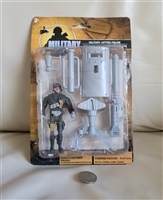 Military 3.75 inch action figure with gear, in box. 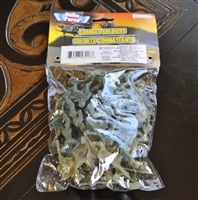 Military action figure with gear from Greenbrier, in box. 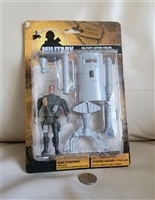 Military posable action figure with gear from Greenbrier, in box. Postcard from the trenches, vintage. LIFE GOES TO WAR: World War II pictionary from 1977 edition. The Atlas of Eastern Front Battles by Will Fowler, hardcover 2002. Vintage wind up crawling soldier toy. Bianchi International M-12 holster 19200. Large vintage wax candle with Eagle and Rooster. Amazing Mustache cup (moustache) in military tone with vintage Austrian or German soldiers transfer ware. Soldiers wall plaque from Colonial period by Dart industries USA military decor. Large photo USS OREGON battle ship 13-7/8" x 9-3/4". The Army: by The Army Historical Foundation, 2001. Soldiers of the World - Musician figure. 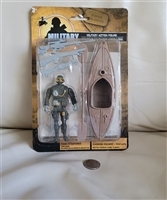 Soldiers of the World - Sharpshooter figure. Soldiers of the World - Sergeant Major - Infantry figure. Americana Folk Art collectible quilted framed picture. Mill Street Design vintage tapestry throw blanket, In Congress July 4, 1776. 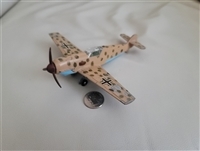 DINKY TOYS messerschmitt BF 109 E aircraft.